Egg production is a normal part of chicken reproduction in healthy, young hens There are many factors that can affect chicken egg production such as nutrition, daylight, and disease. Poultry farmers need to be aware of potential problems that may arise to prevent production losses from your flock and ultimately your egg business. Chickens begin to produce eggs between 18-22 weeks (5 months) of age. 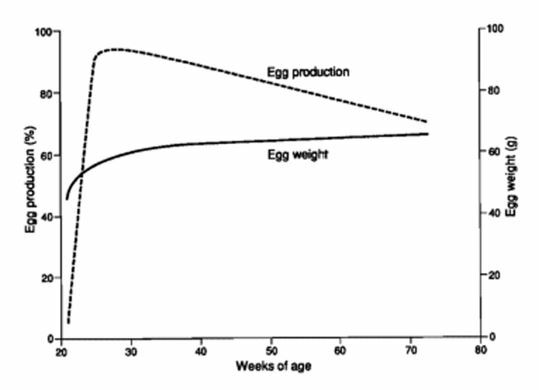 Egg production can hit a peak at 90% in the first 8 weeks, and can decline to 65% after 12 months of production (Figure 1). Egg layers require access to a complete and balanced diet that includes energy, protein and calcium. Table scraps and scratch feeds generally are an inadequate source of nutrition by themselves, and can prevent egg production. Scratch feeds are mainly corn, which provides less than 10% protein, and table scraps can be even lower, depending on what is fed. 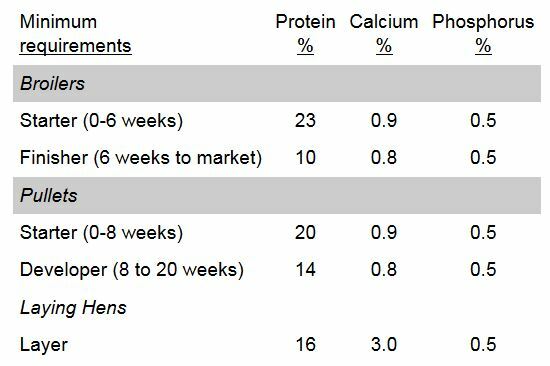 From the table below, you can see hens in full production need 16% protein. Other nutrients such as sodium, calcium and vitamin D are also key components of chicken growth and egg development. Sodium is an important nutrient for reproductive performance. Calcium is important, especially during the time of initial egg production because of its use in the development of eggshells. Vitamin D is necessary for calcium absorption. Without it, calcium sources will be depleted and reduce egg production. Clean water is important nutrient that is often overlooked. Egg layers need access to cool, clean water at all times. Reduced water consumption will also affect total feed consumption. Information on important nutrients for egg layers can be found at http://edis.ifas.ufl.edu/ps029. Daylight stimulates the reproductive cycle of egg layers, increasing production when exposed to more light. Hens typically produce more eggs in the spring and summer months because of the longer exposure to sunlight throughout the day. Commercial farmers can substitute sun light with artificial lighting during the winter months to increase egg production. Things to consider when artificial lighting is used are types of bulbs, wattage, and timers. Electricity bills will rise, so there has to be an adequate increase in production to compensate for the added cost. Information on proper light management for egg layers can be found at http://www.hort.purdue.edu/tristate_organic/poultry_2007/Light%20Management.pdf. Diseases in chickens can be a devastating factor not only on egg production, but to the health of the whole flock. Some common diseases found in egg layers are fowl pox, coccidiosis, and infectious bronchitis. Fowl pox is a viral infection that causes chickens to decrease body growth and production of eggs. It causes sores and scabs on the skin and can be transmitted either by mosquitos or by an infected chickens. Coccidiosis is a form of diarrhea that can be mild to severe. Vaccines and coccidiostates can be used as prevention method. Infectious bronchitis is a virus that can be prevented with disinfectants. This virus can impact egg production and can spread throughout the flock. It is very important to implement disease prevention programs for commercial poultry farms to keep hens healthy, and to keep egg production levels high. Keeping egg layers in a clean environment will prevent decreases in egg production. 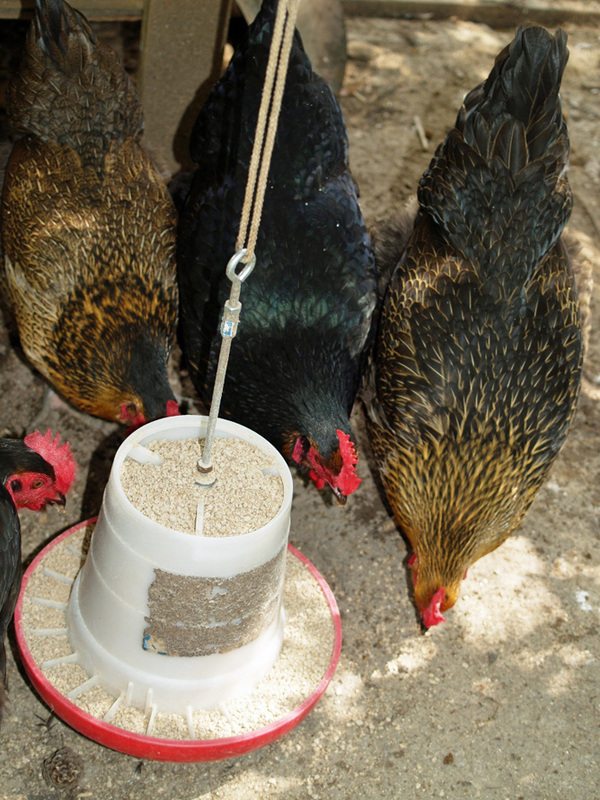 Information on poultry diseases can be found at http://edis.ifas.ufl.edu/pdffiles/PS/PS04400.pdf. It is important to keep good records of daily egg production, so that declines in production can be identified rapidly. The age of the hens, nutrition, day-length, and disease can stress hens and reduce or halt egg production. Agriculture agent at UF IFAS Escambia County Extension.